All transactions are safe and secure with a reliable history in online purchasing behind each of our associates. 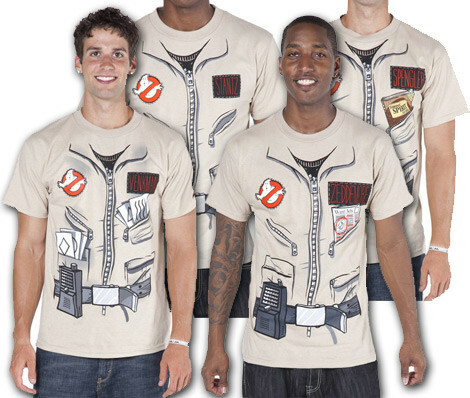 Buy the Ghostbusters Costume t-shirts - Egon, Ray, Peter, Winston t-shirt to own Ghostbusters clothing and merchandise. It doesn't matter if your favorite character is Egon Spengler, Ray Stantz, Peter Venkman or Winston Zeddmore. Choose the Ghostbusters Costume t-shirt that represents your favorite character, or get all four so that you and your friends can do some ghostbusting as a team. The detailed designs even included a PKE meter in the belt, which is used to measure psycho kinetic energy. In addition to the Ghostbusters Costume tees - Egon, Ray, Peter, Winston tee above, browse the Ghostbusters Clothing Gallery for more apparel like men's and women's clothes, kids shirts or hoodies.